Keep an eye out for automotive fluid – Both antifreeze and windshield washer fluid are hazardous to animals. Steer clear of puddles of antifreeze and washer fluid while walking your pooch, and keep pets out of garages and other automotive areas. The ASPCA recommends using products that contain propylene glycol rather than ethylene glycol. Wipe de-icing products off paws – Ice-melting products can get stuck in your pet's paws and then they may try licking it to remove it. Paw pads may also bleed from snow or encrusted ice. If you walk your dog on de-iced roads or sidewalks, make sure he wears booties. And wipe off Fido and Fluffy's paws, legs and stomach when they come in out of the cold. Be wary of rodent poison – If you live in a rural or semi-rural area, you may see more mice move in when the temperature drops. You or your neighbors may be tempted to rid yourself of these pests with rodent poison. Unfortunately pets sometimes eat the poison. If you exterminate rodents, use humane and safe traps rather than poisons. When letting Fido loose in a fenced-in yard, check the area for rodents before letting him out, and try to keep Fluffy inside for the winter. Be prepared to act fast – If you think your pet has swallowed something toxic, call the veterinarian. Watch the temperature – Cats and short-coated dogs don't fare well in frigid temperatures, and even furrier breeds like Huskies and Malamutes can experience problems without adequate shelter. When the nights get cold and snowy, bring pets inside and make sure working dogs have a good doghouse with warm bedding, like straw or woodchips. Indoor pets should sleep off the floor and away from drafts on a dog or cat bed with a warm blanket, according to the ASPCA. Though frostbite and hypothermia is more rare in dogs than in humans, it can happen. Keep cats away from your car – Cats love warmth, so after you park the car, the heat from the engine can entice even the wariest of felines. Once under the hood, your cat could be seriously hurt the next time you start your engine. Keep Fluffy inside, and bang on the hood and honk your horn before starting your engine. With a few simple precautions, the winter can be a favorite time of year for both you and your pet. So grab a warm blanket, curl up by the fire and enjoy getting cozy indoors with Fluffy and Fido. ​The holiday season is upon us, and many pet parents plan to include their furry companions in the festivities. As you gear up for the holidays, it is important to try to keep your pet's eating and exercise habits as close to their normal routine as possible. Also, please be sure to steer pets clear of the following unhealthy treats, toxic plants and dangerous decorations. When you first take your dog to the dog run, try to go during an off-peak hour. It can be very crowded after work or on weekends and your dog may be intimidated by all of the activity. Have his first experience at the park be fun! Before you go to the dog park with your dog, check it out by yourself. Have a look at the park’s posted rules. Ask other dog owners about the vibe at the park – are the other dogs friendly? Are they mostly big or small dogs? Make sure that your dog is socialized to other dogs. Some dogs are afraid of or aggressive toward other dogs. If you have an anti-social pup, consult a behaviorist or trainer to help you socialize him before you become a regular at the dog park. Make sure that your dog’s vaccinations are up to date before taking him to the park. Never take a female in heat to the park. Some parks have rules against intact males. Remove your dog’s leash as soon as you enter the park. Leash aggression is common when one dog is on a leash and the others aren’t. Keep a flat or rolled nylon or leather collar on your dog at all times. Remove a choke or prong collar if you use one. If you bring toys to the dog park, prepare to share them with other dogs. If your dog is not good at sharing, leave his beloved toys at home. If you bring treats, make sure they are secure in a pouch or pocket. Other dogs will hound you for a treat – ask their owners before you indulge them. Recognize the difference between play and aggression. Some dogs play roughly and growl or bark. Many dogs like this level of play, and those that don’t usually avoid the rambunctious player. Recognize aggressive behavior – this includes raised hackles, bared teeth, and growling. If your dog is being aggressive, call him to you and remove him from the park for the day. If another owner’s dog is the aggressor, let him or her know that you feel uncomfortable with the way their dog is behaving – but do it nicely! If a fight breaks out, don’t get in the middle of it! Throw something into the fray, like a coat, or turn a hose on the brawlers. If your dog is involved in the fight, remove him for the day. Do not grab your dog by the collar if he’s in an aggressive mode – this will only fuel his hostility. If your dog is not involved in the fight, grab him before he can join in. Dogs can team up on other dogs, so watch that a weaker dog doesn’t wind up on the wrong end of a gang fight. Watch your dog at all times. It’s inappropriate to leave your dog in the run by himself, talk on your cell phone (to distraction), or read a book. Don’t bring young children to the dog park. If you do bring an older child, enforce a few rules: Don’t approach a dog you don’t know until you ask the owner if the dog likes kids; don’t run around making loud noises – this can provoke the prey drive in some dogs; don’t try to take a toy or food away from any dog; and always keep your shoes on. Our pets are our best friends, biggest fans and most loyal followers. So it makes perfect sense that we want to include our dogs and cats in every aspect of our lives, including date night. After all, not only are pets a perfect ice breaker on an awkward first date, they can be an excellent judge of character. Below you will find 8 ways to include your dog on your next date. However, when visiting a new business or location, confirm pets are allowed, bring food and water for you dog, and make sure he is comfortable interacting in a new setting or environment. Be sure to schedule an appointment with your veterinarian to make sure your pet is in tip-top condition, microchipped and all vaccines and/or medications are up to date before you embark on new adventures. Also, your pet should wear a collar tag with ID. 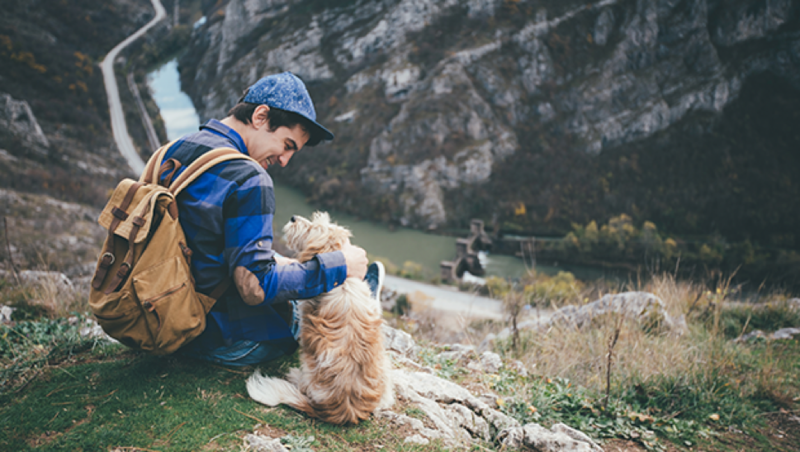 Find a nearby city or town you have never been to and spend a day doing touristy activities with your pet. You can visit National Monuments, famous architecture, popular landmarks and local historical places. Most state parks are dog friendly and they have beautiful trails for couples and their pets to explore. If hiking isn't enough for you, consider camping in the wilderness with your pup and your date. It will be a great, small getaway, providing a much needed break for everyone. Nothing is more beautiful than watching the sunrise or set at the beach. Having your date and pet be by your side is an added bonus. Pick up fruits, vegetables and freshly baked bread from your local farmers market and head over to park for a lunch picnic. The fifties are making a comeback! A lot of local parks during the summer have outdoor movie show times. While your dog might not care about Ferris Bueller's day off. They won't complain as long as they are with you. 5k's are great way to get some exercise and give back to the community and most of them allow dogs. If running a 5k doesn't sound like fun, then don't worry. There are many local events hosted by charities that allow pets, whether it's your downtown local art fair supporting local artist, or a brewery nearby that hosts it annul brew and pooch fest. A date doesn't always mean going out somewhere! Having a dinner date at home is sometimes the perfect option. Whether, it's a barbeque in the backyard or making your grandmother's secret pasta recipe, cuddling with your date and you pet can be a great way to spend the night.